Polly, I think you have the curves confused. 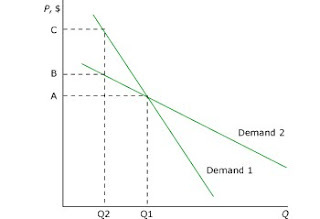 Demand 1 is lower curve and as you can see a large proportionate change in price (from C to A) leads to a large proportionate change in quanity demanded (from Q2 to Q1) therefore it is false to say that Demand 2 is elastic and Demand 1 is inelastic - though looking at the slope of the graph i.e. not analysing you would believe the statement to be true.